Dunfermline Abbey and Palace Ruins is located in the heart of the old town, last year I only visited the church, which is free of charge, but we wanted to see everything this year and it was conveniently part of our Explorer Pass. We were lucky enough to find a free place directly under the abbey and threw a little change into the parking machines. Then we went upstairs into the garden and photographed the ruins and the abbey from the side. A sign finally showed us the way to the ticket shop at the edge of the palace ruin. We got our free tickets and a detailed consultation about the ruin and that there was a really narrow spiral staircase right next to it into the depth, the exit on the upper side of the area had to be specially unlocked, for that he gave us a big key. Conny and Christina dared to go down the narrow spiral stairs, the rest of us went over the back main stairs across the street, from where we had a wonderful view into another, lushly blooming garden in a small valley basin. When I unlocked the metal gate with the big key, Conny and Christina almost approached us from the other side, but we went back to look at the ruins, of which mainly only a row of walls with windows are left, the castle kitchen and the foundation walls of the basement, but Karin and I kept away from it for safety's sake. Many Scottish queens had born and raised their children in this castle, also called the Winter Palace, because it was relatively cosy, it was also rebuilt in the 17th century, before it was strangely abandoned 3 years later. We returned the key to the gate and went to the opposite abbey, built in Gothic and Romanesque style. The abbey itself is a large room with 2 rows of columns and relatively little light, still many old beautiful paintings. The actual Catholic church next to it is still in use and was renovated only a few years ago. Many Scottish kings and queens since about 1100 are buried here, the most famous is surely Robert the Bruce, whose almost complete body (without his heart - this lies in Melrose Abbey - and a few missing finger bones) lies under a richly decorated golden plate, in which his relief is engraved. We walked slowly towards the car, but unfortunately Conny was missing - and with her the car key. We couldn't reach her by phone either, unfortunately this was often the case with the British mobile phone network, only quite a while later, when I climbed the stairs again, she came towards me. 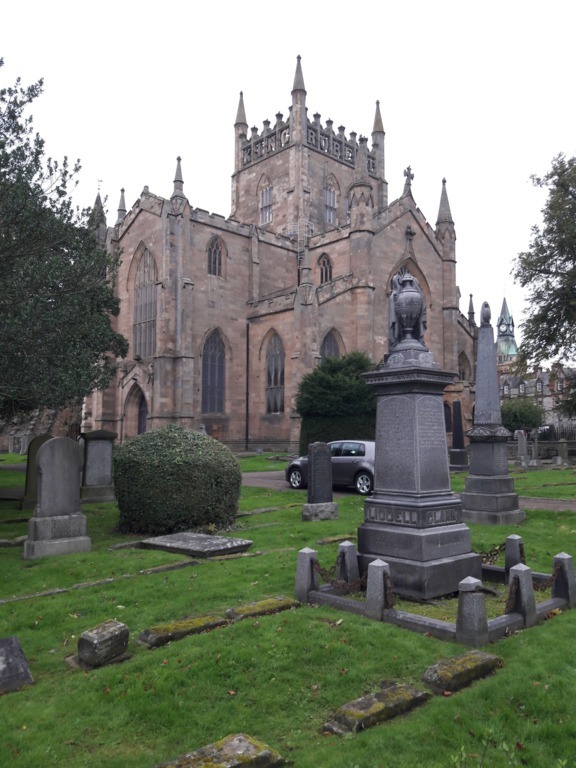 She had met a guide who told her in English and in detail about the neighbouring oldest house of Dunfermline and she was very proud of herself that she had understood almost everything. We drove right past it; until recently the city museum was housed there, but in the meantime it has moved to a new building. Next I filled in the postcode Glasgow to my satnav, there was another destination which I absolutely wanted to visit and which we had not managed during our first stay in Glasgow. We expected the navigation device to send us over the big bridge one last time, but no, it sent us over the northern route and near Culross over the local bridge. I headed for St. Andrews in the Square, a location I had also found on the outlanderlocations.com site, a former church that is now used as an event centre nowadays and which can be visited without admission - so was the information that I found online. I found a parking space right on the side of the roadleading to it. Christina preferred to stay in the car, she didn't feel well. On the spot, we had the feeling that there was nothing going on inside and all the doors were closed, but we discovered a sign with a reference to a café in the lower right floor, which we entered for a short toilet visit and some information. While the others went to the toilet, I asked the landlady behind the bar about the shooting for Outlander. It turned out that Samantha not only ran the café, but also managed the catering upstairs upon occasion and promised to take us upstairs, but instantly said that we wouldn't get much to see. The explanation is quite simple: although the interior still looks like a church, with magnificent sandstone columns on both sides, the production team built a covered room in it for the shooting, so to speak a room within a room, even with a ceiling above it. The columns were wrapped to protect them, but they won't be seen on television either way. They probably had space problems in their studios in Cumbernauld, anyway, this was apparently the largest space, available for two weeks at a time that the production could find in Scotland, so they rented the place. Samantha could also take a look inside at that time, so if we see a church-like room with dark wood and green curtains, it could have been this location. We have to wait until season 4, especially since she couldn't tell us what the theme was at all, we can't guess in which episode this could happen. So we won't be able to recognize the actual location. I asked Samantha, just out of interest, if she had watched the series, knowing that it started in Scotland much later than in Germany. She said she saw only little, most people in Scotland wouldn't watch the show because the actors' Scottish accent was so bad... I was astonished, said that there were quite different accents all over Scotland and she said, yes, but no one sounds like these... All of us were really astonished since, after all, many of the actors appearing are native Scots, Sam Heughan, Rupert Grant, Stephen Walters, Steven Cree, Scott Kyle, Graham McTavish and Gary Lewis, to name just a few. Back home again, I was able to clarify this with Gillebride MacMillan (a teacher at the University of Glasgow), who confirmed that the Scottish accents in the series are fine! Nevertheless, we were extremely grateful for Samantha's help. After leaving the building, we photographed the street or rather the square to the right and left of the church, because Samantha had told us that there had also been shooting there, with old cars and so on. Let's wait for November, we might recognize this sometime in a scene with Roger and Brianna. Now we had to head for our very last destination, the car rental center at the airport. This was easy to find and we started to clean the car thoroughly, not to forget anything. We had a plastic part in the middle, belonging to some part of the central column, which had been loose for days, I first drew the employee's attention to it in order to avoid trouble, but even he simply didn't get it fixed. On the other side, he was very unhappy because the car interior was quite dirty, but I explained to him, we had been five persons on the road for eleven days, in the Highlands, with a lot of getting in and out, often in the rain, and even if we were not piglets and the roads were mostly not muddy, a certain amount of dirt could not be avoided. Christina had even suggested to vacuum the car herself, and we could have done that to be on the safe side. But finally the employee was satisfied and acknowledged the return of the car. Now we went into the airport building, dropped our suitcases and to my biggest astonishment, I didn't even need the online tickets and boarding cards on my mobile phone, we only gave our identity cards to the Lufthansa staff member and got printed boarding cards. After a long walk, which I didn't even remember from my last time in Glasgow, we found the waiting room, where our flight was finally called after half an hour. Unfortunately, we had to take the bus to our plane again, we had 4 seats next to each other (Sabine had already booked her seat in advance) and Karin could choose the most suitable seat to protect her broken arm, unfortunately I could not get an upgrade for her. Already on the flight home, we caught up a little bit of sleep we had missed during the last days, these holidays had been just more of an experience than a recovery vacation. A negative point would be n Frankfurt with the suitcase collection: The fact that you get suitcase carriages only against fee which you can pay only by card, this being a problem particularly for elderly or foreign people who can rarely manage this without assistance. Well, when you have finally managed payment, you need almost superhuman strength to pull a car out of the line. I had to help a Frenchman twice, he was simply overwhelmed and I was pretty exhausted after extracting two carriages. While we appreciate decency at the airport, but they don't have to make it that hard for the people! Sabine was picked up by a pre-ordered taxi service, Karin by one of her daughters (both of whom still take good care of her until today! ), Christina went to her pre-booked train and Conny and I got picked up by my husband. We had already arranged on a meeting 5 weeks later to exchange pictures and experiences and simply to be together again. The "withdrawal symptoms" after 12 days of intensively being together were quite hard for everyone. Until today, we are in touch by whatsapp and email. Furthermore, the manager of Edinburgh Castle contacted me and confirmed the validity of the tickets as noted in the Explorer Pass - so we can catch up on our visit to Edinburgh next year! I'm really looking forward to it!! I saved a lot of money in the afternoon with Karin in the hospital instead of shopping on the Royal Mile, I had much less souvenirs than planned, but that will surely be different next time!